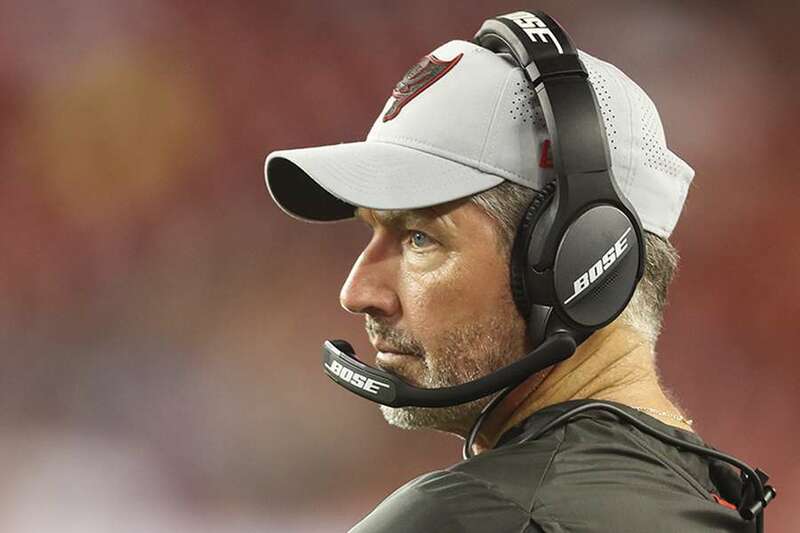 Koetter preaches the importance of establishing the run, but the numbers disagree. “We’re going to be a run-first football team,” Dirk Koetter said in 2016, during his first training camp as head coach of the Buccaneers. The Bucs were coming off a season in which they were one of the most successful rushing teams in the league, at least by traditional measures. They gained more than 2,000 yards on the ground and almost 5 yards a carry. But they won only six games. The Bucs continued to run in 2016. They rushed nearly as many times as they had in 2015, but they gained 500 fewer yards. And their win total? It increased. The Bucs didn’t run as often last season, partly the product of them falling behind early in games. They also continued to struggle to run efficiently. During this past training camp, Koetter talked again about the relationship between running and winning. The question is, though, are those teams winning because they’re running? 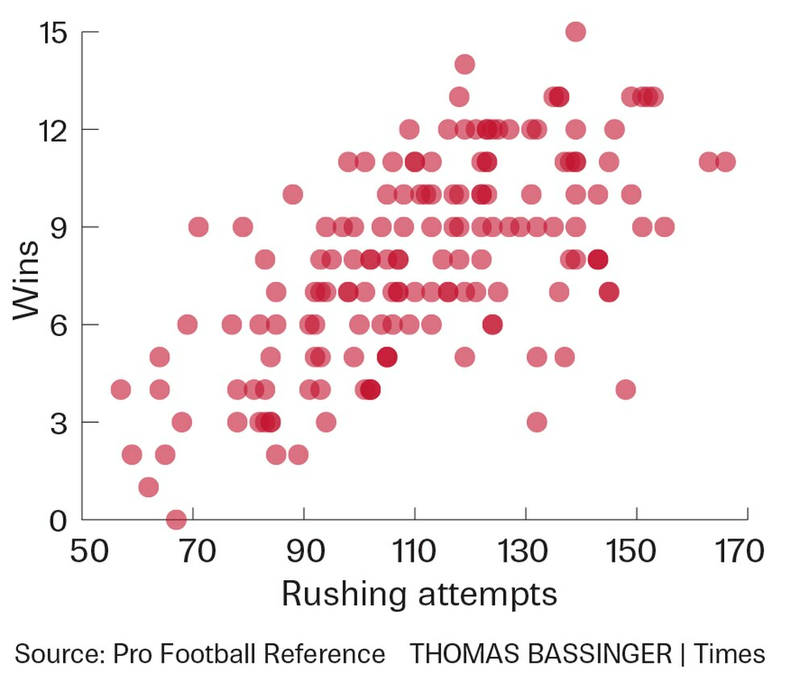 To find out, I revisited an old Football Outsiders study on the “establish the run” theory and analyzed rushing data on each team from not only last season but also the past five seasons. While Koetter’s statement about last season is technically accurate, it implies there is a cause-and-effect relationship between running and winning. There are exceptions, but in general there is no such relationship. Teams run when they win, not the other way around. Let’s look at the teams who ran the ball most often early in games last season. Establishing the run didn’t work out too well for the Browns. They ran the ball more often in the first quarter than any team except the Bears, and yet they didn’t win a single game. Not one. Of the 10 teams that ran the most in the first quarter, six missed the playoffs. And two of the teams that did reach — the Bills and Titans — were more mediocre than good. They were the lowest-scoring teams in last season’s playoff bracket. What about the teams that ran the least often in the first quarter? How many of them made the playoffs? The teams that ran the least often early — the Rams, Patriots, Chiefs, Saints and Falcons — were among the most successful. The only team in that list that finished with fewer than eight wins was the Dolphins. This wasn’t just a one-season blip. In 2016, the 49ers led the NFL in first-quarter run percentage, and they won two games. The Patriots and Falcons ranked in the bottom 10, and they faced each other in Super Bowl 50. Related: The Falcons lost the Super Bowl not because they didn’t establish the run in the first quarter but because they didn’t run enough in the fourth quarter. Scatter plots show whether there is a relationship between two variables. When we plot first-quarter rush percentages and wins from the past five seasons, the scatter plot looks like a used dart board. If there were a strong positive correlation, you’d expect to see the points follow an upward pattern. What about the teams that gained the most rushing yards in the first quarter last season? Is there a relationship between rushing yards and wins? More quality teams populate the list of leaders in early rushing yards, but so do bad and mediocre teams like the Broncos, Packers, Giants and Bengals. As for the list of teams that gained the fewest rushing yards, there’s a mix there of good, bad and mediocre there, too. Again, this is the norm. When we plot first-quarter rushing yards and wins from the past five seasons, there’s no discernible pattern. Simply put: Teams that commit to running the ball have to be successful at it. Teams that aren’t successful at it should stop. Running for the sake of running doesn’t work. 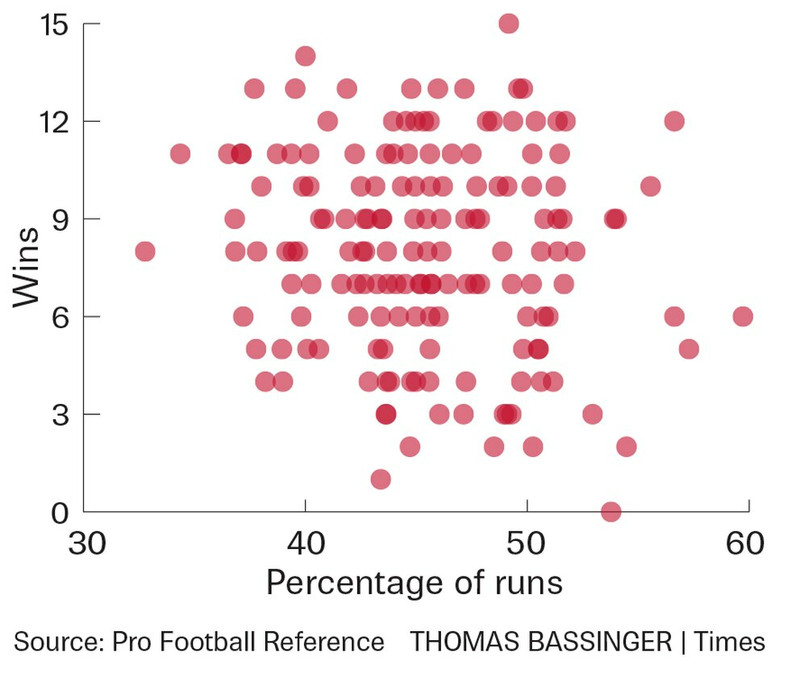 Run-first football teams don’t win more games. To test the theory that teams run when they’re winning, let’s examine fourth-quarter rushing data. The 10 teams that ran the most in the fourth quarter were among the NFL’s best teams. Each of them won at least nine games and an average of 11 games. The 10 teams that ran the least were among the NFL’s worst teams. Other than the Lions, none of them won more than seven games. On average, they won 5.4. The teams that emphasized the run late weren’t necessarily doing it because they were successful at it. They were doing it because they had the lead and wanted to drain the clock. The teams that weren’t running the ball were trying to catch up, and you can’t do that if you’re gaining 4 yards at a time. Look no further than the Bucs. They entered the fourth quarter holding a lead only four times last season. When we plot fourth-quarter rushing attempts and wins from the past five seasons, we — finally — see a relationship. 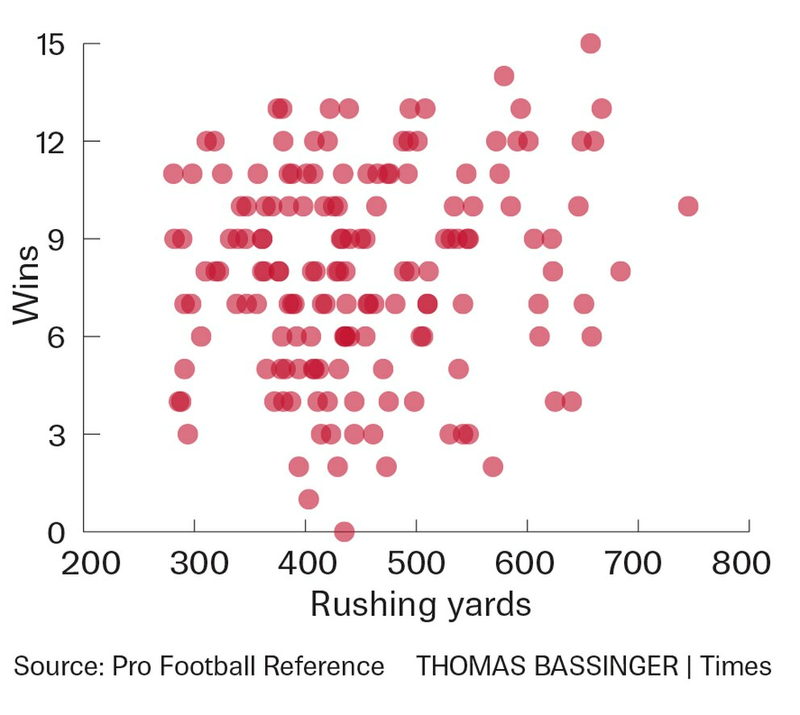 Most of the teams that lead the league in rushing yards aren’t gaining the bulk of those yards early in the game. They’re padding their numbers in the fourth quarter. That’s when seconds on the clock are more valuable than yards. What does all of this mean? The Bucs’ run-first identity isn’t working. They ranked 29th in first-half point differential (-72) in 2017, 21st (-25) in 2016 and 24th (-42) in 2015, which was Koetter’s first season calling plays in Tampa. The defense bears responsibility for that, but the offense is starting too slowly. The Bucs ranked 26th in first-half points scored (136) in 2017, 22nd (167) in 2016 and 15th (175) in 2015. Since 2015, the Bucs have rushed more often in the first quarter than any other team, continuing to do so even as their efficiency has declined. In 2015, they averaged 4.9 yards per carry, which ranked fifth best. That average slipped to 4.2 in 2016 and again to 3.6 in 2017. That’s something to change, not repeat, so why keep doing it? Except teams don’t need a run game to make their play-action game work, as a Football Outsiders study from earlier this year concluded. “I cannot find any support for the success of play-action passing being related in any way to team’s rushing statistics, whether measured by frequency or effectiveness,” author Ben Baldwin wrote. In short, the Bucs have been more productive in the first quarter when they’ve passed than when they’ve run, ranking among the league leaders in yards per pass play and percentage of first down conversions over the past three seasons. 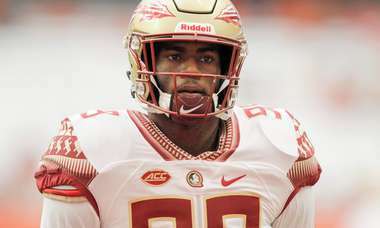 It’s time for the Bucs to stop beating their heads against the wall. The modern NFL is a pass-first league, and the best time to pass is when you don’t have to. Plus, the Lightning beats the Capitals. And, the brackets are set for the NCAA tournament.